Cartier noticed that the Aboriginal peoples of Canada used kanata when referring to their settlements, and took this to be the name of the entire country. Andrew: Real Talk #002. We are going to do a Real Talk episode where we focus on practical expressions for everyday situations. And in today’s episode, we will focus on how to give and ask for directions. So Morag and I are going to present you with a dialogue, and after the dialogue, we will explain some of the key expressions used when giving and asking for directions. Morag: In today’s dialogue, Al and Beth are late for a meeting. While they’re walking downtown, they realize they have no idea where to go, so they decide to ask somebody for help. Andrew: Let’s get to the dialogue. Beth: Hurry up. We’re gonna be late for the meeting. It starts in 15 minutes. Al: Where is it again? What’s the address? Beth: Uh, it’s, um, 599 Richmond Street. It’s in the Imperial Building. Al: Are you sure? Don’t we have to go the other way then? Beth: No. I … It’s this way. I mean … Well, I don’t think so, but let me check my phone to make sure. Ugh, my gosh! It’s going so slow. The connection is garbage. I can’t find anything. Al: OK. Let’s just ask somebody. Beth: OK. Good idea. I’ll ask that guy over there. Beth: Hey. Excuse me, do you know where Richmond Street is? I’m looking for the Imperial Building. Man: Uh, yeah. It’s just a couple blocks away. Take a right at the next set of lights, and then, go straight for a block or two. You’ll find it. Beth: Oh, great. Thank you so much. Beth: OK. He said it’s just a couple blocks away. Let’s go. We can still make the meeting on time. Morag: And now, we’ll explain the key vocabulary from this dialogue. Andrew: Our first key expression for this episode is how to ask for directions when you need to find where you’re going. So in this dialogue, we heard Beth ask the question, “Excuse me, do you know where Richmond Street is?” And this is the most classic, the most straightforward, the most to?the?point way to ask for directions—do you know where [mmm] is? Andrew: Exactly. You could say, “Do you know where the statute is?” “Do you know where the brown building is?” “Do you know where Main Street is?” Any place you can insert into that blank, and this question will make sense. Morag: Absolutely. You could even say, “Do you know where my hotel is?” Whatever you need to find, it’s a really useful expression. Andrew: And I think a lot of times, people don’t know how to approach a stranger. It can be a little bit intimidating. And I think this question, excuse me, is a really great way to get a stranger’s attention. Morag: I would completely agree. You’re never going to be rude or have an uncomfortable time with a stranger if you start out with excuse me, and then, go in with a question. Andrew: Expression number two for today is I’m looking for [mmm]. I’m looking for [mmm]. And in the dialogue, we heard Beth say, “I’m looking for the Imperial Building.” So, again, this is a nice way to approach a stranger when you need help and give the specific location that you need to go to, the specific location that you’re looking for. Morag: Yes. I’m looking for [mmm] can be used for pretty much anything, if you’re looking for a restaurant or you’re looking for a building. Andrew: But I imagine if you had Google Maps, maybe you wouldn’t need to ask for directions. Morag: Well, sometimes. I mean, as we saw in this dialogue example, sometimes you don’t have the reception that you’d like, especially in Canada. Andrew: Yes, exactly. And especially if you’re travelling, right? Andrew: Sometimes the roaming or the internet network that you’re used to in your home country can be quite different. So it’s a good idea to have these expressions ready just in case you get lost. Andrew: Mmhmm. This reminds me of a story that happened to me not too long ago, where I was inside the building I had to be in, but I took the elevator to the wrong floor. And I was wandering around aimlessly, lost inside the correct building, and a security guard asked me, “Can I help you?” He was a little suspicious of why I was there. Maybe I was in a place I wasn’t supposed to be in. So I simply told him, “Yeah. I’m looking for room 502.” And he helped me find where I needed to go. So yeah. You’re right. Even when you are close to where you need to be, sometimes you can still get lost. Morag: It’s something that just happens, so some of these expressions are very useful even if your phone is working. Andrew: Definitely. OK. Let’s move to expression number three. Morag, what is expression number three? Morag: Expression number three is it’s just a couple blocks away. This makes the most sense in cities. Saying something’s just a couple blocks away means it’s quite close, but it’s not a precise measurement ’cause a block is the distance on a street in between two intersections. So if you’re walking down a street and you are at an intersection, by the time you get to the next intersection, you will have walked one block. It’s a little difficult, but if you can imagine it in your mind, you can know what I’m talking about. Andrew: So you’re exactly right. A block is a unit of measurement that we use in North America, especially in a downtown area of the city. And so a block is the distance from one intersection to the next intersection. And blocks are different sizes in every city, but I would say, roughly, it will take 1 minute, maybe 2 minutes, to walk from one block to the next block. Would you agree with that estimate? Morag: Yeah, Andrew. I would agree with you that in most downtown cities blocks are reasonably uniform, so it’ll take about a minute or two for each block in that city. Montreal is funny like that though. I live on a block that takes about 3 minutes to walk down. It’s nuts. Andrew: It’s true. In Montreal, the downtown has blocks that I would consider to be a normal size. Andrew: But towards the north of the city, in the Plateau and in the Mile End, the blocks get bigger, especially in the Mile End. Some of the blocks take quite a while to walk down. Morag: I live on one of those. It’s quite funny though. If you are in a city like that or an area like the one I live in, the blocks running north and south are very long. The blocks running east and west are very short. So sometimes, depending on what city you’re in, it can be a very imprecise measurement of time to talk about blocks. If you’re in somewhere like New York City though, it’s really quite precise. Andrew: And I get the sense that Al and Beth are very close to the building they’re looking for, the Imperial Building, because the man they ask for directions says, “It’s just a couple blocks away.” So if it was really far away, he wouldn’t use this word just. So I have the sense that they’ll be able to find the building in just a couple of minutes. Morag: I would agree. Yeah. Andrew: OK. Let’s move on to our fourth key expression for today, and this is take a left and take a right. In the dialogue, we hear the stranger who is giving Al and Beth directions say, “Take a right at the next set of lights.” So this simply means turn right at the intersection. The set of lights refers to the traffic lights. So he wants Al and Beth just to go straight until they hit the set of lights, the traffic lights, and then, take a right or turn right. Morag: This is a really common thing that you’ll hear in directions, someone telling you to take a left or take a right at a landmark. So if you’re taking a right, turning right. If you’re taking a left, then you’re turning left. Andrew: Exactly. OK. And finally, our fifth key expression for today is go straight for [mmm]. Andrew: OK, go straight for. And the preposition for here is very important because it communicates that we have to go a certain distance. In the dialogue, we hear, “Go straight for a block or two.” But we could easily say, “Go straight for 10 minutes,” or “Go straight for 1 km.” We use this expression go straight for to tell someone that they have to continue for a certain distance or a certain amount of time. Morag: Yes. So we don’t tend to say, “Continue along the street that you are current …” No, no. It’ll just be, “Go straight for …” A given distance or amount of time. Andrew: OK. So those are today’s five key expressions that you should use when giving directions or asking for directions. Here’s the dialogue one more time. Please listen for these expressions in the dialogue. The phrase where is the closest something? can be used when you need to find a type of place, not a specific address; simply substitute the term something for the place or location. It is also a very useful question for gathering information when in a new area. As discussed in this episode, adding the phrase excuse me before a question, like where is the closest something?, is a more courteous and polite way of asking for help. Heather: Excuse me, where is the closest breakfast restaurant? Local: Just a couple of blocks away. Heather: Can you tell me how to get there? Local: No problem. I’ll show you on my phone. Tony: Hi! Sorry to bug you; I know we will be landing soon, but can you help me for a second? Stewardess: Sure! What can I do for you? Tony: I haven’t made any reservations yet, and I’m pretty tired. Where is the closest hotel to the airport? Stewardess: There’s one right across the street from the airport. We have a shuttle to bring you to and from it. When we land, I’ll point you in the direction of the shuttle. How would I get to somewhere? is a very general way of asking for directions to a place. You can use this question in almost any situation where you need more information about how to reach a destination, whether near or far. How would I get to should be followed by a specific address, intersection, or location. Dan: Pardon me, how would I get to PEI National Park? Local: You can’t miss it. Keep going straight down this road. In about 2 minutes, the road will curve and you will see a sign on your left for PEI National Park. Follow the signs from there. Dan: Thanks for your help! Milo: Excuse me, how would I get to Calgary? Local: You’d have to take a bus or train. I’d take the bus if I were you. It’s so much cheaper! Petra: Excuse me, how would I get to Parc Jean-Drapeau by metro? Local: That’s easy. Continue on until you get to Berri-UQAM, and then, take the Yellow Line to Jean-Drapeau. Petra: That sounds easy. Thank you for your help. Sometimes it’s difficult to understand spoken directions, especially if you’re in an unfamiliar location. If you are having trouble understanding the directions someone is trying to give you, the phrase can you show me on a map/phone? is very useful. Can you show me on a map/phone? 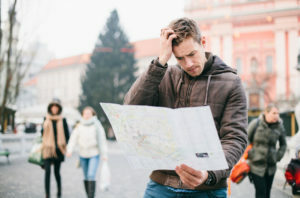 is a polite way of communicating to the person giving you directions that you are still not sure how to get to your destination, and you would like to be shown the directions rather than just told verbally. Wade: Excuse me, can you tell me where City Hall is? Wade: I’m sorry, but that sounds complicated. Can you show me on a map/phone? Local: Of course. Here, let’s use my phone. Peter: I think we’re lost. I have no idea how we’re supposed to get back to the highway. Jess: We should ask the first person we see for help. Hey, there’s someone! Peter: Let me pull over. Jess: Excuse me, how do we get back to the highway? Local: Take the A road, but make sure it’s not the A1! It’s gotta be the A.
Jess: Can you show me on my phone? Local: All right. It’s this one right here. When you’re trying to figure out directions in a new place, sometimes knowing how far away you are from your destination is as important as knowing how to get there. How far is it to somewhere? is an incredibly practical phrase that can be used in many different situations. If you’re trying to figure out how much time it will take to get to your location, you can ask someone this question. Hilda: Excuse me, but I’m a bit lost. How far is it to the nearest subway station? Local: The nearest one is about 4 km away. Hilda: Oh dear. How would I get there? Local: There’s a bus across the street that will take you right to the subway. Hilda: Thank you very much! Tamara: Pardon me, can you tell me how far it is to a good sushi restaurant? Local: You’re in the wrong part of town for that! There’s nothing great around here. Tamara: What’s good in this area? Local: There’s a really great Italian place just down the street. Tamara: How far it is to the Italian restaurant? Local: Maybe a 5-minute walk. Different accents, slang, rate of speech, confusion of a new place—getting directions can be really overwhelming! It’s important to be able to let someone know if you don’t understand what they’ve said. The phrase I’m sorry, but I didn’t get that is a respectful and friendly way to communicate that you did not understand what the other person said. Stew really can’t understand the accent of the person who is trying to give him directions. Stew: I’m sorry, but I didn’t get that. Can you show me on my phone? Kara is having a hard time understanding the directions that she is being given to the zoo. Kara: I’m sorry, but I didn’t get that. How would I get to the zoo? It’s late in the day and Marta knows she won’t remember all the directions the local is giving her. Marta: I’m sorry, but I didn’t get that. Can you repeat the directions while I write them down? 1. Which of the following can replace the term somewhere in the expression how would I get to somewhere? 2. When would you say, “I’m sorry, but I didn’t get that”? 3. Which of the following questions is best to use when you want someone to show you how to get to your location rather than tell you how to get there? a) Where is the closest something? b) How far is it to somewhere? c) Can you paint me a picture? d) Can you show me on a map? 4. If you use the question how far is it to somewhere?, what are you asking for? 5. If you are trying to find an Indian restaurant nearby, what’s a good question to ask someone? a) Where is the closest Indian restaurant? b) Where is the best Indian restaurant?